I suppose I’m a bit of a craft butterfly, flicking from one type of project to the next depending on what I’ve not been able to pass by without buying, what random things I’ve been given/upcycled or what I’ve seen on Pinterest/blogs. This project is no exception being a combination of the above. My Nan had bought a load of random, colourful plates from car boot sales years ago to make a mosaic for her garden but never got round to it. 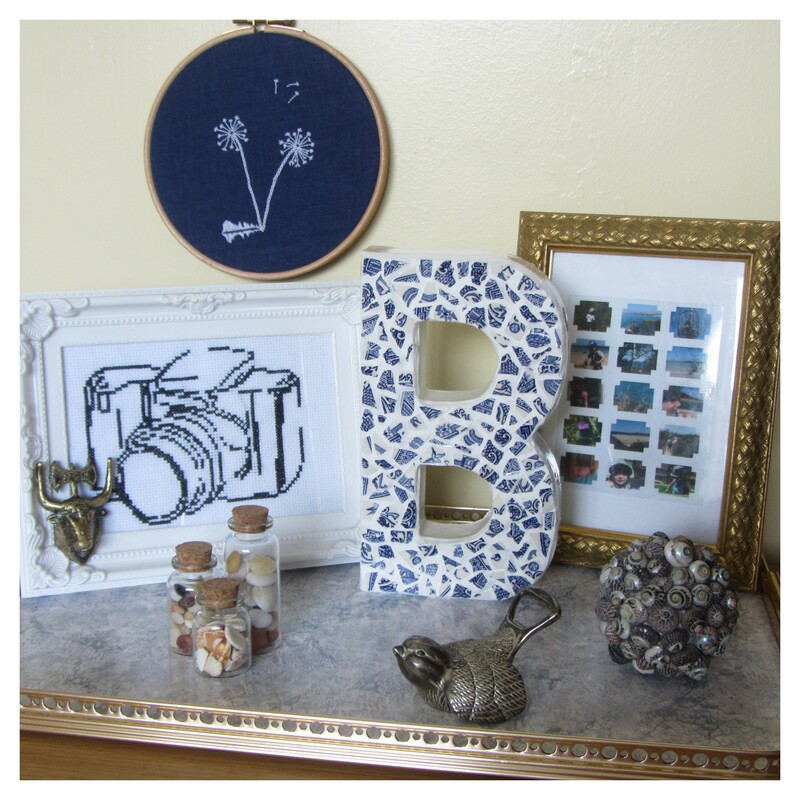 I thought it would be fun for us to do some crafting together, and when I saw this project at the end of last year after a google search, I really wanted to try it. I originally made a ‘G’ back at Christmas for my niece’s bedroom door, along with a mosaic-ed jewellery box, and then an ‘N & M’ for my sister and her boyfriend back in the spring (plus a sequined ‘&’). At the same time I started a ‘B’ for myself, but it sat half finished until this week when I decided that with my imminent house move, I should get all my half-done projects completed. White paint (I used some gloss paint as I like the shine, but emulsion, acrylic or poster paint could also work). Decide if there are any motifs you want to keep whole on your plate. Mine had a flying bird so I made sure that I was more careful when breaking around that area. Wrap your plate in the towel and (wearing your safety specs) break your plate with the hammer so the pieces are around 1cm or smaller. I tried to get a range of shapes and sizes and sorted them by size to make arranging the mosaic easier. Select pieces with right angles for any corners, and decide where you want any specific motifs to go. Cover part of your letter in PVA glue (I did about 1/4 at a time). Starting with your corner/specific motif, place your mosaic pieces into the glue. As the glue takes a while to dry, I found I didn’t need to plan where each piece would go (and I can never transfer the pieces into exactly the same place anyway). Once the whole letter has been covered, allow the glue to dry fully. Mix your grout according to the directions on the packet in the disposable container with the old spoon. Mine was 3 parts powder to 1 part water, and I ended up using 4 tbsp of powder and 4 tsp of water). I found it easiest to use my finger to squish the grout into the grooves but I did get some little cuts from the sharp edges, so maybe a flexible spatula would be better. 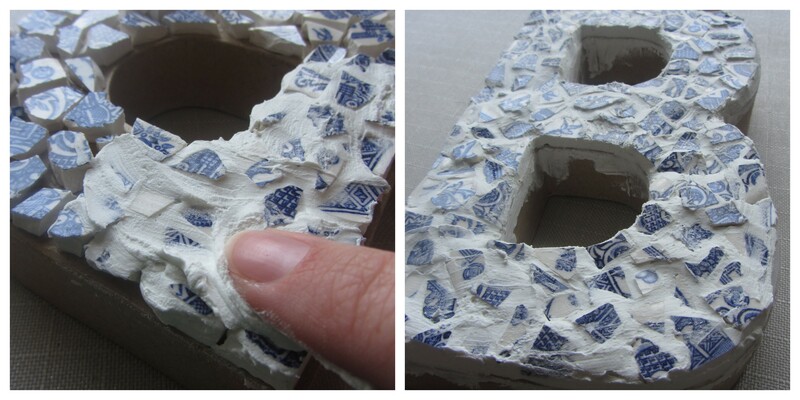 Make sure you grout the edges of the letter too, but don’t worry too much about getting grout onto the cardboard. Use your finger to straighten the edges of the grout and remove any excess grout from the crockery pieces. Once the grout has completely dried, use the sandpaper to remove any excess grout from the cardboard and remove any bumpy bits around the edge. Scrap off any excess grout from the crockery pieces (I used a bobby pin hair clip, but on previous versions I just used my fingernail as there wasn’t as much to remove) and then a dampened paper towel to clean any dust off. Paint the cardboard white, leaving to dry between coats. I really love my letter and think it’s a great cheap project as I only had to buy the cardboard letters and grout, so approximately £1.20 per letter, but I’ve seen strong PVA in the DIY section of pound shops, as well as different paints, so even if you had to buy these it wouldn’t be too expensive. Love that! How big was the finished letter? Thanks! It’s 20cm high, about 11cm wide and 2.5cm deep plus about 0.5cm of tile/grout. It’s incredible. I love how uniform the broken pieces are. How did you break them so evenly? I just kept bashing the plate with the hammer until the pieces were about the same size. I think using the wedge-shaped side of the hammer made the breaks more accurate. You can get tile cutters, but the hammer worked well enough for me.